Abbildung 1: Entwicklung der Meereisbedeckung in der Arktis (blau) und Antarktis (rot). Quelle: Climate4You. Seit 1980 hat sich die arktische Meereisbedeckung von 12,5 auf jetzt 10,5 Millionen Quadratkilometer verringert, was etwa 16% entspricht. Zuletzt hat sich das Eis wieder vergrößert (Abb. 1). Einige alarmistisch veranlagte Zeitgenossen hatten mit einem viel schnelleren Rückgang gerechnet. Laut einigen Vorhersagen, sollte das arktische Meer schon heute eisfrei sein. So hatte Al Gore dem Eis 2008 nur noch 5 Jahre gegeben, bis es vollends verschwindet. Eine Fehlprognose wie wir heute wissen. 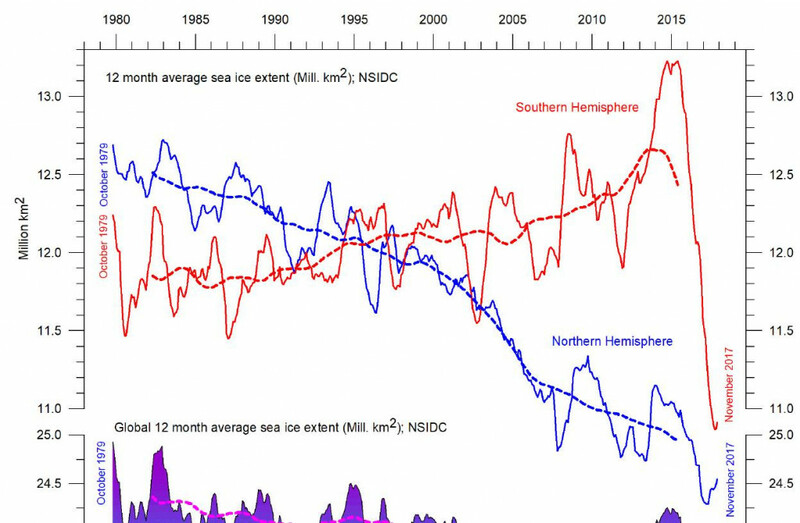 Genauso schlimm waren die Vorhersagen von Peter Wadhams., der nach 2016 einen eisfreien Nordpol postulierte. Ganz falsch. Ein Mann der bewusst die Pferde scheu machte. Uncovering universal early warning signals for critical transitions has become a coveted goal in diverse scientific disciplines, ranging from climate science to financial mathematics. There has been a flurry of recent research proposing such signals, with increasing autocorrelation and increasing variance being among the most widely discussed candidates. A number of studies have suggested that increasing autocorrelation alone may suffice to signal an impending transition, although some others have questioned this. Here we consider variance and autocorrelation in the context of sea ice loss in an idealized model of the global climate system. The model features no bifurcation, nor increased rate of retreat, as the ice disappears. Nonetheless, the autocorrelation of summer sea ice area is found to increase in a global warming scenario. The variance, by contrast, decreases. A simple physical mechanism is proposed to explain the occurrence of increasing autocorrelation but not variance when there is no approaching bifurcation. Additionally, a similar mechanism is shown to allow an increase in both indicators with no physically attainable bifurcation. This implies that relying on autocorrelation and variance as early warning signals can raise false alarms in the climate system, warning of “tipping points” that are not actually there. Scenarios of a sea ice tipping point leading to a permanently ice-free Arctic Ocean were based on oversimplified arguments. New research by Till Wagner and Ian Eisenman, scientists at Scripps Institution of Oceanography, UC San Diego, resolves a long-running debate over irreversible Arctic sea ice loss. 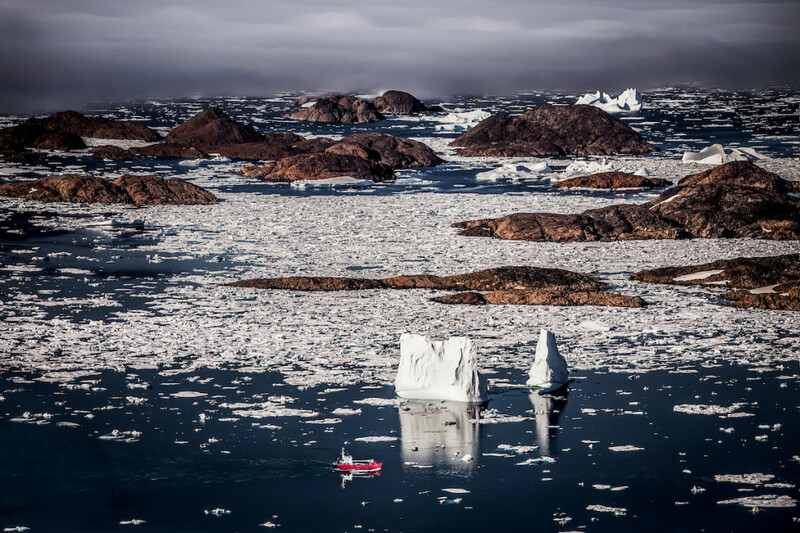 Ever since the striking record minimum Arctic sea ice extent in 2007, the ominous scenario of a sea ice tipping point has been a fixture in the public debate surrounding man-made climate change and a contingency for which Arctic-bordering countries have prepared. For decades, scientists have been concerned about such a point of no return, beyond which sea ice loss is irreversible. This concern was supported by mathematical models of the key physical processes (known as process models) that were believed to drive sea ice changes. The process models forecasted that increased global warming would push the Arctic into an unstoppable cascade of melting that ceases only when the ocean becomes ice-free. - On seasonal time scales, atmospheric internal variability and its imprint on sea ice renders skillful predictions of September sea ice coverage more than two months in advance inherently difficult. - On annual time scales, negative feedbacks stabilize the sea ice cover. There is no “tipping point” beyond which the loss of the remaining summer sea ice becomes unstoppable. - On decadal time scales, internal climate variability can cause a substantial acceleration or temporary recovery of the sea ice cover that renders the evaluation of individual model simulations based on their short-term trends impossible. - On longer time scales, internal variability causes a substantial spread in possible 30-year long trends supporting for the production of large model ensembles. Nevertheless, the impact of anthropognic forcing on the long-term sea ice evolution is clear, with an average loss of 3 m2 of September sea ice cover per metric ton of anthropogenic CO2 emission. The practical consequences of climate change challenge society to formulate responses that are more suited to achieving long-term objectives, even if those responses have to be made in the face of uncertainty1,2. Such a decision-analytic focus uses the products of climate science as probabilistic predictions about the effects of management policies3. Here we present methods to detect when climate predictions are failing to capture the system dynamics. For a single model, we measure goodness of fit based on the empirical distribution function, and define failure when the distribution of observed values significantly diverges from the modelled distribution. For a set of models, the same statistic can be used to provide relative weights for the individual models, and we define failure when there is no linear weighting of the ensemble models that produces a satisfactory match to the observations. Early detection of failure of a set of predictions is important for improving model predictions and the decisions based on them. We show that these methods would have detected a range shift in northern pintail 20 years before it was actually discovered, and are increasingly giving more weight to those climate models that forecast a September ice-free Arctic by 2055. Modelle, die ein schnelles Verschwinden des Arktiseises postulieren, sind offenbar wenig vertrauenswürdig. Erst ab 2055 könnte es soweit sein, falls die Erderwärmung ungebremst fortschreiten sollte. Wie geht es nun wirklich weiter? Wissenschaftler nehmen heute an, dass sich das Meereis im arktischen Atlantik in den nächsten zehn Jahren wieder vergrößern wird, wie Eos 2016 unter Hinweis auf Yeager et al. 2015 berichtete. Grund: Die Ozeanzyklen. Arctic sea ice extent plunged precipitously from 2001 to 2007, then barely budged between 2007 and 2013. Even in a warming world, researchers should expect such unusual periods of no change — and rapid change — at the world’s northern reaches, according to a new paper. “Human-caused global warming is melting Arctic sea ice over the long term, but the Arctic is a variable place, said Jennifer Kay, a fellow of the Cooperative Institute for Research in Environmental Sciences at the University of Colorado Boulder and co-author of the new analysis out today in Nature Climate Change. Natural ups and downs of temperature, wind and other factors mean that even as sea ice slowly melts, random weather can mask or enhance the long-term trend. For example, even in a warming world, there’s still a one-in-three chance that any seven-year period would see no sea ice loss, such as in 2007-2013, the new analysis shows. And the chaotic nature of weather can also occasionally produce sea ice loss as rapid as that seen in 2001-2007, even though the long-term trend is slower. Neither time period should be used to forecast the long-term future of the region, Kay and her colleagues concluded. Some commentators tracking sea ice trends have used the recent “pause” in sea ice loss to claim that human-caused climate warming is not occurring; others previously used the rapid decline from 2001-2007 to speculate about ice-free Arctic summers by 2015. Neither claim is warranted, the authors report. “To understand how climate change is affecting the Arctic, you cannot cherry pick short stretches of time,” Kay said. “Seven years is too short.” The research team, led by Neil Swart of Environment Canada, analyzed both long-term records of Arctic sea ice observations and an extensive dataset of results from global climate models. From the model runs, they could calculate the chances that certain types of scenarios could play out in a slowly warming Arctic: For example, just how likely is it that sea ice would not decline during a seven-year stretch? The team focused on September measurements of sea ice, which is when the extent reaches a yearly minimum. By early October, Arctic sea ice generally begins growing again, a seasonal response to colder temperatures and shorter days. The researchers determined that a seven-year period is too short to accurately capture long-term sea ice trends in the region. Even given long-term melting, there’s a 34-percent chance of randomly getting an unusual period of no change or even growth in sea ice, and a 5-percent chance of a period of very rapid loss, similar to the decline in 2001-2007. The team also increased the time period of analysis, to see if longer spans of time would be long enough. In about 5 percent of model simulations, there were even 20-year time periods with no loss of sea ice, despite strong human-caused warming. “It is quite conceivable that the current period of near zero sea-ice trend could extend for a decade or more, solely due to weather-induced natural variability hiding the long-term human caused decline,” said Ed Hawkins, a co-author and researcher at the National Centre for Atmospheric Science, University of Reading. “Human caused climate warming has driven a decline in Arctic September sea-ice extent over the past few decades,” the new paper reports, and “this decline will continue into the future.” But understanding how and why natural variability affects sea ice trends should help scientists better predict how sea ice will evolve in upcoming years and decades, with implications for natural ecosystems, shipping routes, energy development and more. A main concern of present climate change is the Arctic sea ice cover. In wintertime, its observed variability is largely carried by the Barents Sea. Here we propose and evaluate a simple quantitative and prognostic framework based on first principles and rooted in observations to predict the annual mean Barents Sea ice cover, which variance is carried by the winter ice (96%). By using observed ocean heat transport and sea ice area, the proposed framework appears skillful and explains 50% of the observed sea ice variance up to 2 years in advance. The qualitative prediction of increase versus decrease in ice cover is correct 88% of the time. Model imperfections can largely be diagnosed from simultaneous meridional winds. The framework and skill are supported by a 60 year simulation from a regional ice-ocean model. We particularly predict that the winter sea ice cover for 2016 will be slightly less than 2015. Every year an increasing amount of sea ice is melting in the Arctic. This can start a chain reaction, which leads to increased production of algae and hence more food for creatures in the sea. When spring arrives in the Arctic, both snow and sea ice melt, forming melt ponds on the surface of the sea ice. Every year, as global warming increases, there are more and larger melt ponds. Mats of algae and bacteria can evolve in the melt ponds, which can provide food for marine creatures. This is the conclusion of researchers in the periodical, Polar Biology. - Given that larger and larger areas of melt ponds are being formed in the Arctic, we can expect the release of more and more food for creatures in the polar sea. Heidi Louise Sørensen studied the phenomenon in a number of melt ponds in North-Eastern Greenland as part of her PhD thesis at University of Southern Denmark (SDU). Bo Thamdrup and Ronnie Glud of SDU, and Erik Jeppesen and Søren Rysgaard of Aarhus University also contributed to the work. For some time now, researchers have been aware that simple biological organisms can evolve in melt ponds – they may even support very diverse communities. But so far it has been unclear why sometimes there are many organisms in the ponds, and on other occasions virtually none. - Climate change is accompanies by more storms and more precipitation, and we must expect that more nutrients will be released from the surroundings into the melt ponds. These conditions, plus the fact that the distribution of areas of melt ponds is increasing, can contribute to increased productivity in plant and animal life in the Arctic seas, says Professor Ronnie N. Glud of the Department of Biology at SDU. • When the sea ice disappears, light can penetrate down into the water. • When the sea ice disappears, wind and storms can stir the water up, bringing nutrients up to the surface from deep water. When it gets warmer on the mainland, this creates more melt water, which can flow out into the sea, carrying nutrients in its wake. Diese Art von Algen im Meer nennt man auch Phytoplankton. Und sie sind sehr wichtig – denn sie regulieren das Klima. Die Algen nehmen beim Wachsen Kohlendioxid auf und geben Sauerstoff ab.